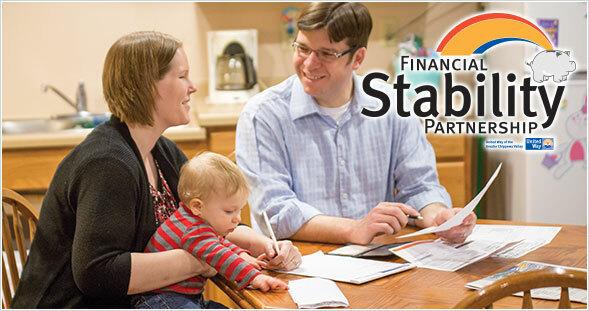 Financial Stability Partnership is a United Way initiative created to help individuals and families achieve greater financial stability through financial literacy and opportunities for career advancement. This page offers information to help you reduce debt and save money, as well as information and support available for those interested in moving forward in their careers. The first step to financial stability is to clearly lay out where your money is going. This means creating a budget sheet and marking down all of your monthly expenses. This will take at least a month to prepare. Be sure to keep all receipts as a complete record of your spending and categorize them so they can be referenced as you lay out your budget. Once you have completed your budget, total up all dollars spent. Take this total, and subtract it from your total household income. The term “disposable earnings” refers to all dollars you are free to spend after all other financial obligations have been met. Optimally, you want the result to be a positive amount. A negative amount means you are spending more than you are earning. Now it’s time to use your budget worksheet to see how your spending can be adjusted so you have more money available to pay off debt and build an emergency savings. This will mean tightening up on spending and making some sacrifices. Think of your budget sheet as a treasure map. It is going to be the best way for you to follow a path and dig up dollars you may not have realized are available to you. There may be many ‘X’s on your map. As you look over your spending, identify unnecessary purchases. Are you stopping at the gas station for a coffee every morning? Have you been unable to resist impulse purchases such as clothing or accessories? You must remember: every one dollar you can save each day means $365 extra dollars in a year’s time. Next, examine other expenses that could be adjusted. Your heating/cooling costs can be reduced by adjusting your thermostat. Are there basic plans available for Internet, phone or cable that you can switch to? Doing so could free up a lot of money. Are there items on your grocery bill that you could do without? Are there cheaper alternatives to what you are buying? Could you save money on gas by carpooling, riding a bike, or taking public transit? Hopefully, by making some adjustments, your budget will have freed up some dollars for you. Now, you need to set a goal. Most important is to put a savings schedule into your budget just like any other bill or expense. This will be an emergency savings fund so that, when unforeseen expenses occur (car repair, doctor’s bill or other situation), you will not have to go into debt, or otherwise not able to make a repair or maintain your health. Research has shown that a low-income household with only $500 in emergency savings is more financially stable than a moderate-income household with no emergency savings. Even if you are experiencing extensive debt, it is very important to still put money aside, even if it is only $25 a month, for emergencies. Pay off small debts first. Once you have budgeted for a savings plan, the next step is to examine your debt. Believe it or not, one strategy for reducing your debt is to pay off your smallest debt first. You can eliminate your smallest debt quickly, then carry over those payments to your next smallest debt, and so on. Scrape together whatever extra dollars you can (collect your loose change!) to remove those small debts, then you will find you have more dollars available to pay your larger debts. You may also want to look into debt consolidation as a party of this strategy. By getting help through various debt management services, you may be able to combine all your large debts under a better interest rate. Make sure, however, to find a reputable service for this. Contact us if you are interested in counseling services to help you with debt consolidation. Call 715-834-5043 or click here to email us. Assign special funds for your incidental spending. For example, based on your budget, determine what you can afford as an entertainment fund. Perhaps it’s $40 a month. This helps control your spending and will help you make sure you don’t overdo it on a night out with friends. A great way to manage this is to keep those dollars as cash in your wallet or purse. That way, you know exactly how much you have. And, if you’re planning something special such as an anniversary dinner, you can plan on storing up those dollars so you can afford that night out. Identify other things you spend money on regularly that can be controlled, such as a clothing fund. Prepare for bi-annual and annual expenses—Don’t be surprised by insurance bills and car registration fees when they arrive every six months or once a year. Work them into your monthly budget and put that money aside so that you are ready when those expenses occur. If you don’t have it, don’t charge it—You may find it easier to simply avoid using credit cards if the temptation is too strong. If you feel you can be responsible, however, you can use your credit card for daily purchases, but make sure you immediately allocate those funds so you can pay the balance off at the end of the month and avoid interest charges and debt. In this way, you can take advantage of any awards benefits your card offers, which could give you free gift cards or gas cards to offset other expenses. Average out your heating bills – Many residents in our neck of the woods find winter months to be a financial burden due to heating costs. To avoid this, you can speak with your utility company to bill you based on average usage. In this way, you know what you are going to pay each month. Or, average your utilities yourself, storing the extra dollars in the summer months to be used in the winter months when heating costs soar. The IRS Savings Plan—Some people find they don’t have the willpower to save dollars, no matter how hard they try. They instead have more dollars withheld from their check and get a big tax return of dollars they would have otherwise spent. However, often times, these dollars simply end up being spent unwisely on luxury items, which defeats its purpose as a savings plan. If you can be disciplined and committed to managing your money, an alternative strategy is to have LESS taxes withheld from your check. That extra money per pay period can instead be used to pay down debt or go toward your emergency savings. Just make sure you do not have too little withheld so that you owe at tax time, and be prepared that you will not have a windfall tax return. Where can you get more help? If you are looking for financial counseling, or just have questions on how you can obtain financial stability, call 715-834-5043. You will be asked some questions to help identify your specific needs, and then provided with the best options.